This entry was posted in Episodes and tagged Kings, Politics, renly baratheon, War. Bookmark the permalink. Just wanted to give you a heads up that my podcast client gets really confused by your RSS feed. Every time it refreshes it thinks you’ve changed the episode and constantly re-downloads episodes. I had to go in and change the settings to make it stop. You might want to look into your RSS. I imagine that is costing you all some bandwidth. I’m using the DoggCatcher client on android. I seems to handle other feeds correctly. Let us know if you continue to to encounter the issue and we can run it up to ACast. 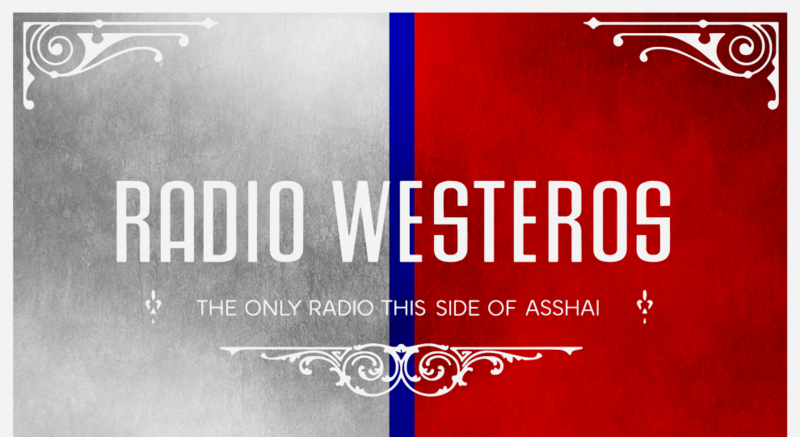 Hi, Radio Westeros, thanks again for a really great episode. There’s a lot of fandom and a lot of podcasts out there, but there truly is no one else who elevates book discussion to the level of great storytelling the way you do. I wanted to share a little tidbit with you that I am pretty convinced was a reference or inspiration for George’s choice of a peach for Renly’s scene about enjoying life, and that, for me, adds another, bittersweet layer to the brothers’ interactions. Did you know that, for the past two thousand years in China, being gay is referred to as “loving the shared peach?” It’s not a sexual innuendo, or a derogatory phrase at all. The story of origin involves a duke who was eating a peach, and the peach was so delicious that the offered the rest of it to the man he loved, because his beloved’s enjoyment of the peach was more precious to him than his own. It became a symbol of a selfless love between men. So, Renly being a peach-sharer is a reference to an ancient society where being gay was considered pretty normal, and totally compatible with being a ruler and a military hero. And, I think, as well, even though Renly doesn’t like Stannis, as you mention in the episode, he does love him, and offering him a peach, wanting him to enjoy the moment, is a historical symbol of that love as well. Hope you guys are well, and I look forward to your book-to-show recaps w History of Westeros!! I had a problem with my podcatcher (mediamonkey). It could not get a handshake to download this episode until I updated my software. Maybe Derek should try updating his software; perhaps your new feed uses a newer protocol?